Every day when you set out on your commute, you expect your car to start in the blink of an eye. After all who wants car problems early in the day? Your car’s battery, starter relay and most importantly the starter are responsible for starting the engine. If any one of these fails, you are going to have problems starting your car. Of these three, the starter is the most important as it is the one component that is joined directly to the engine. Its healthy functionality ensures you have quick starts every time. The starter is usually found at the rear end of the engine where a gear on the starter positions itself with the engine’s flywheel to begin the ignition process. As soon as the starter starts working and the flywheel moves, the fuel pump starts and the injectors send in fuel to the cylinders and the engine comes to life. If this process does not happen correctly, the engine doesn’t start up and it means you need to book a visit to the mechanic and get the starter looked at. A malfunctioning starter will destroy your mood early in the morning. Therefore, it is better you get the starter checked before you have to face any disappointment. But in order to do that you need to be able to know the signs of a failing starter and how to fix it if possible. Here we will go through the symptoms that accompany a bad starter. The starter should ideally turn on the engine but when it has gone bad, it is possible that you turn the key in the ignition and nothing happens. When there is absolutely no activity in the engine after your attempt ignition, it probably means the starter solenoid or the starter motor has gone awry. This could also be possible if there is an electrical malfunction in the starter or your battery has died. Due to a number of possibilities, it is best to let a mechanic do the final diagnosis. When you turn your key for ignition, you hear a clicking sound in the engine bay. This sound is the starter coming to life. However, sometimes you hear the clicking sound but the engine still doesn’t start. That means the starter is having some mechanical issues probably with its gears that connect to the engine’s flywheel. It might be possible that the gear has misaligned with the flywheel, or that the gear itself has worn out from extensive use. If this happens, you should visit your mechanic and get your car’s starter replaced. It can also be caused by a dead car battery. When the starter’s gears depreciate due to constant use, your starter will have to work harder to power the flywheel and you will hear a grinding noise. However, this can also happen if you the starter is malfunctioning on the inside. In any case, a cranking noise means you have to replace your old starter with a new one. The starter needs a proper flow of electricity to work. If there is any fluctuation in the ampere or voltage from the battery, the starter can experience a short circuit. In other cases, the starter can send out smoke if it is being overworked even after the car has started. You might also have a blown fuse in the system that is causing the smell. It is best to hand off the technical work to a mechanic who is well versed in these kinds of problems. The starter is a mechanical and electrical car part, therefore just like any other car part out there, the starter needs proper cleaning and maintenance. Here we will give you a proper idea to clean a starter and the connectors. Sometimes it can be enough to clean the gears and the connections to it. But in most cases, you have to replace the starter. Remove the car battery before doing any work to the starter. The starter is attached to the motor usually with two screws. Undo them with the screwdriver and you will have the starter in your hand. Now comes the tricky part, which is disassembling the starter. Since that is beyond the scope of this article, you can look at this helpful guide to help yourself out. this it is time to clean the insides. There are many cleaning agents available in the market but if you don’t have that available you can always use alcohol to clean the insides. Also clean the connections with a electric cleaner. Once you have done the cleaning, let the starter out to dry so that all the left-over alcohol evaporates. Finish off by applying grease everywhere on the inside. Use the syringe as an agent to help you reach narrow and impossible areas in the starter. Reassemble the starter to its original state and use the screwdriver once again to install it back to its place. Make sure there is no alcohol left around anywhere. After you have cleaned the starter, it is time to check if it works. The simplest way to do this is to start your car. If you are experiencing the same problems as before, if the engine is still unresponsive, you definitely need some repair on the starter. And for that, you need to visit the mechanic. The mechanic might be able to repair the starter if there has been an electrical failure but if the mechanical function of the starter has been compromised then there is no other way through than to get a replacement. 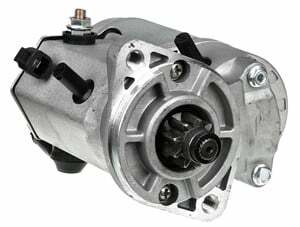 A replacement starter can cost you around $150 – $400 depending on your vehicle and its model. The cost of the starter is also subject to the availability of the starter in the market. If you have an old car, you might face problems getting a used starter let alone a new one. Furthermore, you would have to bear the costs of labor which can border around $70 – $150.